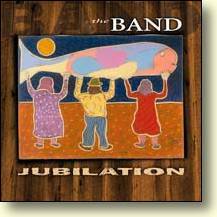 "Jubilation finally and decisively reaffirms and expands The Band's sound and soul." "A damn fine album that proves that The Band is still alive, still original, and still masters of good old time Americana Music." "The ringing sounds from guitar, bass, dobro & mandolin strings echo out from the wooden sound boxes to mix with drums, accordians & harmonicas. Every once & a while someone picks up a horn to add a lonesome wail to the sound. 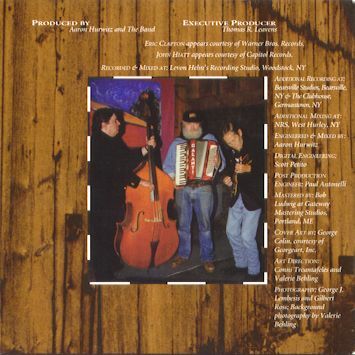 From the back, Eric lets loose a few notes on his electric guitar ..."
The Band's studio album Jubilation was recorded in Levon Helm's Woodstock barn in the spring of 1998, and released by River North Records on September 15th the same year. It includes songs written by Rick Danko, Levon Helm, Garth Hudson, Bobby Charles, John Hiatt (also guesting), and Allen Toussaint, and has Eric Clapton playing slide guitar on the song "Last Train To Memphis." Jonathan Katz' on the song "Don't Wait"
See also the Jubilation promotional video. In January 2003, Intersound Records re-released Jubilation in their Original Artist Hit List budget CD series. Jubilation was also released as a limited-edition colored vinyl LP. The LP is a little different from the CD in packaging, and the back of the cover has the printed autographs from the members. The International Music Group AG (TIM) in Germany released Jubilation in Europe in April 2003, as part of the "Noble-Price" series on their Documents label, with new cover art. With comments by Jubilation producer Aaron Hurwitz. Rick was playing 'Book Faded Brown' even before we started working on High On The Hog. He recorded a very electric version, more as a solo project, during some sessions in Chicago. It came up when the Band wanted to do more personal songs. I work with a group from Ireland, Four Men and a Dog, and their heroes are Hank Williams, Bob Dylan and the Band. 'Don't Wait' was on a demo tape of songs Kevin Doherty, the lead singer and songwriter, wanted to record for a solo album. Levon knew he could fall right on it and we played it with him on acoustic guitar, me on accordion and Randy on drums. We had to ask Kevin if he would let the song go, but he was thrilled to have it become a Band song. Bobby Charles, who wrote 'See You Later, Alligator' and 'Walkin' To New Orleans,' used to live in Woodstock and hung around with the Band. He sent 'Last Train to Memphis' to Levon, who added some verses and gave it a real party feel. It's as much about Beale Street and the Cotton Festival as it is about Elvis. Rick wrote 'High Cotton' with Tom Pacheco, who has been very helpful from the start of this project. He got the title from Levon's book, and the whole concept of the song was to reflect the good times in the South when the cotton was ready to be harvested. The guy in the song, C.W., is a good friend of Levon's from Arkansas. Lee started writing 'Kentucky Downpour' with Marty Grebb on the set of 'Fire Down Below,' the Steven Seagal movie, but never quite got it finished. When we started recording Jubilation he wrote the bridge and a melody, and everybody else helped out, including Levon’s daughter, Amy, who sang background vocals. We recorded this tune a number of times to get it to really swing. We listen to a lot of tapes, and this was on a tape of about 25 John Hiatt songs. He's been a friend a long time, and we felt this song would work well acoustically. Everyone's background vocals really gives this song the right down home feel. This is about how the guys used to sell places out in 1965 as The Hawks, during their rockabilly days. Yonge Street in Toronto was the big hangout, and I think there was a circuit starting in Arkansas, where Ronnie Hawkins and Lee were from, up through Chicago, Detroit and into Canada, where they picked up the other members of the Band. Ronnie came down to hear the record, and he loved it. Once again, Tom Pacheco was there 100 percent helping us out. Rick changed a few lyrics and Jim Weider gave us a lot of strong melody lines to open up the song. It's kind of a battlefield anthem, but I also think the song is about the kind of desperation everyone feels at times, when they're really alone. I think of 'Spirit of the Dance' as being an extension of 'Life is a Carnival,' because it is a bit of a departure for the Band with all the percussion. There's some new rhythms going on there, along with some good feelings and meanings. Mike Dunn, the Crowmatix bass player brought in this Allen Toussaint song, and we just started playing it to check out the studio, to get a good drum sound. I think the party feel carried over to 'Memphis,' which we recorded soon after. We tracked it pretty easily, since it was a song that was already laid out. Garth's sax work is great. We were thinking about the 30th anniversary of Big Pink and how to reprise 'Genetic Method,' which is what the intro to 'Chest Fever' is called. Garth played the synthesizers and tenor and alto saxes like a Duke Ellington section, so there's a nice harmony. Then he added the accordion melodies and a few other tricks. Limited-edition colored vinyl LP released in September 1998.